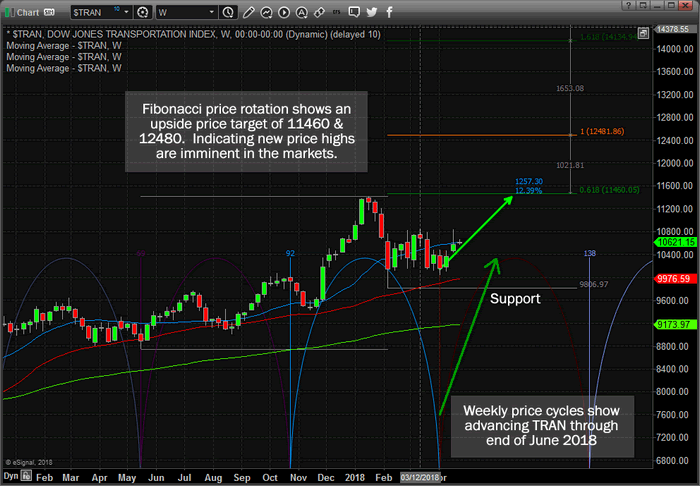 This chart of the Transportation Index clearly shows the Weekly price cycle rotations and the recent cycle bottom that occurred on April 2, 2018 – about three weeks ago. This cycle bottom also coincided with the major market bottom formation and early stage price rally that we’ve been experiencing for the past few weeks. Support is currently at 9800 in the TRANS and we believe this cycle pattern will drive the US major market and TRAN higher till near early July 2018. We believe this move could be explosive to the upside as our ADL price modeling system shows that anytime a price anomaly setup occurs, price usually attempts to re-balance itself with the predictive modeling behavior in a quick and sometimes violent price move. Be prepared for a potentially explosive upside move here folks. If you want to know how to take advantage of these moves and stay ahead of the markets, then visit www.TheTechnicalTraders.com to learn how we help our valued subscribers find and execute success every week. These types of tools are only one component of what we offer our members – we also offer Daily video analysis of the market, advanced research posts, Daily updates and more. We know we are the only research team that can offer you these types of advanced predictive modeling systems and you can see the value we can offer you. If you have ever wanted to know what the markets are going to do with relative certainty, then you owe it to yourself to see how we can help you see opportunities more clearly.